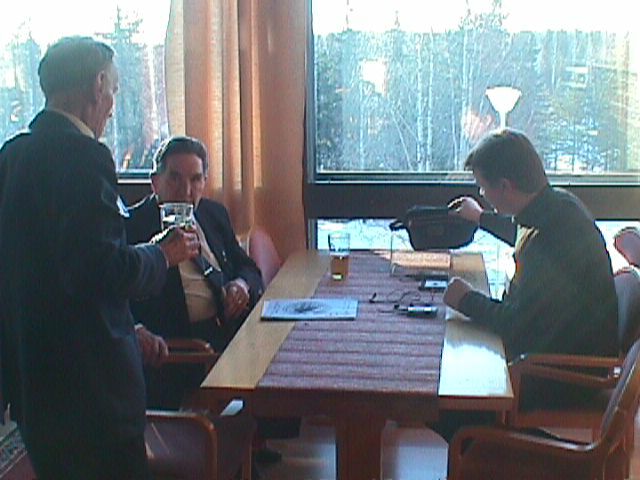 Risto "Korva" Korva interviewed Blenheim pilot Pentti Aro in the annual meeting of the Lapland Air Command Guild, March 24th 2001 at Rovaniemi. The interview was transcribed by Jari "Elk" Halivuori. Original Finnish language article translated to English by SubLt Markku Herd, Finnish Navy. Next to him on left mr. Eino Estama (read article Estama brothers or Virtual pilots cater to Air Force veterans). I used to live in Oulunkylä, Helsinki. When the Winter War broke out, I was working in the service department of Radiolaite Oy ('Radio Device Ltd'), it was in the Stenberg house in Hakaniemi, opposite to the current Suur-Elanto building. We got training in shifts in tri-weekly training courses, that were held daily at Profession Advancement Institute. One guy had just come from such a course and he was just telling some stories when someone said, "listen to that, what's that, that's an air raid alarm." We went to Hakaniemi marketplace, it was crowded with people. Two planes flew over. I guess they were (Tupolev SB-2) SB-2's, but I knew nothing of airplanes back then. It was war, we concluded, and I went right away to reserve the company's only van to come to my house in the evening. It came with a driver, since I was only 17 at the time. We packed my mother and two sisters in with some mats and took them to father's home of birth at Sohbacka, Vihti. Next day I went to quit my job. Mr Usko Vainikainen, one of the three owners of the company, happened to be there. "Well, where's Pentti going now?" I said I was going to war. He told me not to leave, I wouldn't be accepted. I quit anyways. But when I visited a few staff headquarters, they wouldn't even listen to what I had to say. I didn't feel like going back to Radiolaite, so I went to the Yleisradio Workshop at Merimiehenkatu. I knew one Engineer Sainio there. Foreman Ranta took me to the workshop and told me to start putting together equalizers, piece of cake for me. This was work by count, he said. I thought this was going to make me rich and began working. Guess it was my third day there when one old gaffer came to me and said that I had misunderstood, work by count is done slower than work by hour in here. That day was at end, so I thought that goddamn I'd have a proper talk with him the next day, there was a war going on and lack of everything, and he tells me to do poor work. But when I got home, a paper was waiting for me, a reply to one of my several applications: I was to report at Hotel Emaus to the Air Force Mechanical School on February 20th. I left Käpylä in the morning of the 20th, I was supposed to be in Tampere by 10 AM. It took me 26 hours to get there, because Riihimäki got bombed and we had to spend a day there. I reported at Emaus, and we were taken to the public school of Rantaperkkiö, where the Mechanical School was located at the time. I'll tell of my first day in the School. We got guard duty from day one - and of course it was in alphabetical order so I was the first. Warrant Officer Palle Virtanen was our quartermaster. Reportedly he had been the quartermaster in a disciplinary company, a straight-backed, short, really smart guy. Virtanen asked if everyone in guard duty knew how to use a rifle. It was damned cold and we had only rubber-toe boots, so I said "sir, I've never even touched one." I thought he'd lash out at me, he made such disapproving sounds in front of me. But when he calmed down, he put me to the last shift and replaced me by one Corporal Sistonen (who later worked with Aero and Finnair) and Bohelm, both from Helsinki. I was given two hours of rifle training and learned to use one. The Mechanical School took about three months, and from there I was sent to Tikkakoski. It was end of May and damned hot, and I was wearing fur cap and mantle. Second Lieutenant Terva was the company commander. The August crew, who had served in the Winter War, were released at that time. I found out that I belonged to Squadron 44 of Flight Regiment 4, and we were moving right then to Kemi. So I spent Summer '40 in Kemi. I was the squad record-keeper, and I had a Finnish-made 'Kotka' (VL Kotka) plane as my responsibility. When it was time to apply to pilot school, 26 of us did. Our own doctor disqualified half, twelve got to send their applications. Parental approval was required, but I wrote those myself. When I was accepted, I wrote to my parents that I had to forge their names because there was such hurry, I'm in pilot school now. So it began, the 11th. Flight Captain Suhonen was on the same course with me. I got Lieutenant Varis as teacher, he gave us the psychological test. When I went to see him, he thrust a paper with six or seven six-digit numbers to me and told me to look at them while he spoke in telephone. When he finished the call, he took the paper back. Then I had to tell him why the birth rate is bigger in countryside than in towns, why Finland fought the Winter War when the Baltic countries didn't, and some other things like that. Then he told me to write down the numbers that I had seen before. I did, and when I was leaving I asked him if I got any right. It was satisfactory, he said, I had switched two digits in two series. Damn good, I thought, do the same boys. I had no tensions at all after the test, it released me completely. I was accepted, with good score I thought. But recently a guy, one Molanen, has checked those things in the war records and made a table of the scores, and it was actually pretty close call. So I flew 12 hours with Varis. He yelled at me like mad, it was his style, and I said this isn't going to work out. But the graduation flight had to be done. Captain Pursiainen oversaw it, he told me to do five solo landings, and I did. I ended up serving over two years. I had some five solo flight hours behind me, when we were on a winter camp at Lappajärvi. In an exercise we had to do wide level turns at 300 meters, then climb to 500 and do tight ones. And when I was doing the tights, all controls went slack. We had orders that if the stick goes slack, we had to eject. I opened all belts, took off the goggles and was going to bail out, but then a thought occurred to me. The steering wires went around in the cockpit, I tried out which affected what, and used those to land on the lake Lappajärvi. The only trouble I had was the bright sun, it was hard to see the surface. I prolonged the touchdown so that it was the back of the ski that touched ice first. Lt Varis had followed my flight, he came and ranted at me, because he thought I had run out of gas and forgotten to open the reserve tank. I told him what had happened, and he went all quiet. The plane was a Smolik (Letov S 218A). Some two weeks later I got promoted to Private 1st Class. At the same time one Hattinen, who later got killed at Koivulahti, got detention for sleeping during watch. He was also a student of Varis. When Varis came, he said first his condolences to Hattinen, then congratulated me but added that he couldn't understand why I got awarded. I thought of asking him why he had suggested it then, it was clear that it wouldn't have passed if he hadn't. One soldering had failed, and when I realised it I knew it didn't make the plane uncontrollable. And I landed on ice, I really didn't see the surface even by the shadow of the plane. I flew perhaps twenty different plane types during the training, the most with the Pyry (VL Pyry). I thought it was damn nice plane to fly, some had real problems with it, but I learned its tricks during 60 hours. A fine plane for a domestic one. Then we were in the Reserve Squadron at Vesivehmaa and got to fly war plane, the FR (Fokker D.XXI) that had been used in the Winter War. I got transferred to Squadron 42 of Flight Regiment 4 in Värtsilä. Lumiala was the squadron commander, Eskola had left some time before, Lumiala was later replaced by Kalle Kepsu. In the Continuation War I flew some two hundred hours with the "Blenu" (Bristol Blenheim MkI), I went straight there without flying fighters. I had been a mechanic, I knew the Blenheim well and really liked it, I was damned happy I got there. The only good alternatives would have been the Me's (Messerschmitt Bf109G2/G6) or Brewsters (Brewster Model 239) . All others were so slow, for example the Curtisses (Curtiss 75A Hawk) that were escorting us at the Aunus Isthmus couldn't climb higher than 6,000 meters, we were photographing at 7,500. The Blenheim had crew of three: pilot, navigator and gunner. The navigator worked as bombardier and gave bearings to the pilot. Photographing wasn't pleasant work, you had to fly straight despite AA shooting close. The photo was ruined if you tried to dodge, you had to go even through a puff if needed. I flew bombing missions too. Värtsilä had long runway so you could have loaded 800 kg of bombs into the Blenheim, but our wartime base was at Naarajärvi and it had so short runway that we could take only 400 kg, plus some incendiaries. I'll tell of two missions. It was funny that we got no tips from anyone, we were just told to go there and take photos at 5,000 meters. One time we took off from Värtsilä, refueled at Solomanni (next to Äänislinna, current Petroskoy) and went on from there. The job was to photograph lakes by the Arkangel railroad at 5,000 meters. We discussed the altitude, of course, in our opinion we had to go low. We were at 3,000 meters when Vilperi (Willberg? ), the navigator, pointed out 20 La-5's preparing to attack us. I put the plane to nose dive, we escaped east - even if Solomanni was right behind us. Vili Leino was my gunner and damned slow one, he died a couple of years ago, and he was like a sports commentator urging me to pull up. I thought to go right to the deck, it was easy with the Blenheim, so that the guys behind couldn't pull up anymore, but we didn't see any smokes. The Blenheim dove at over 600 km/h, the normal cruising speed was about 380 km/h. The enemy came after us, I saw streaks go by but Vili managed to keep them away, and of course they lost us when we were low. Then we climbed to 5,000 meters and took the photographs. The only bombs we had were incendiaries; on our way back we saw a train coming from south and I said to Vilperi, "let's drop them on that train." "No," he said, "let's follow orders as given." We came back at 50 meters and dropped the incendiaries on long rows of log cabins with thatch roofs. After the war I was afraid the Supervising Commission [the Allied, mainly Russian, committee overseeing Finland after the war] would inquire who dropped those bombs, and I didn't speak of them until later. The navigator decided where we dropped the bombs, he was the commander of the plane and had the orders. We had no secondary target, and that was strange. Our engines were so worn that they were running out of oil before fuel. I ran the engines in turns, one engine rested on low revs while the other pulled. We were already declared missing by the time we got to Solomanni. The flight took about three hours. The Solomanni mechanics thought the plane shouldn't fly any more, but Vilperi ordered them to fill the oil tanks, the plane had to be taken to Värtsilä. It took 50 minutes to fly to Värtsilä, we got there safely but the oil was again drained. The plane was then taken by train to Tampere. By my reasoning the Lapland War was led by the Overseeing Commission, and there we flew. You can say the clouds hung at treetops. We were supposed to be released from service at Naarajärvi, when we got orders to bomb Germans at Ranua at 2 pm. I got Lasse Sjöström as my navigator, he lives in Switzerland now and is obscenely rich after patenting all ship hatches. "We're not really going to bomb Germans, are we?" he asked, but I said, "war is war, and we bomb as ordered." When we took off he still wondered if we should bomb even if they don't shoot at all. "Let's consider if they don't," I said. We came over target, there were eight planes and I guess the others considered the same. "See now," Lasse said, "they don't shoot at all." "We're soon neck deep in it," I was saying, when they opened fire. Captain Salo's plane was some twenty meters left of us and it got hit, lets out smoke and begins to fall. "How about some bombing," I asked Lasse. "Let's bomb!" We were too low to drop sensitive 100 kg bombs, so I climbed to clouds. When we were at 300 meters, I told Lasse to drop them. We couldn't see if we hit, the other planes scattered. The ground forces were on the move, we encountered them on our way back, between two fells on the same road there were Germans with trucks - and the 'organ guns'. Someone had said the Germans didn't have them, but they had salvaged some. The 'organ gun' is a Russian multi-barreled machine gun. There was one, and we were at 200 meters at best. I took us down to two meters, thinking that if we're to die, we're not going alone. They all dove to ditch, we went right above the ground. The Germans had fighters there too, even if they were mainly at the Arctic Sea protecting ships. We didn't encounter them, though. My last mission was to bomb Germans at Kilpisjärvi, and did they shoot. After dropping the load we passed over Swedish territory, and the Swedish AA fired at us. I guess others did the same, there is a story about the Swedes calling on radio, "You're over Swedish territory." "We know that," the boys answered, "but you shoot so wide to the left." "We know that," the Swedes replied. They weren't so serious about it, even if they fired at all foreign planes over Sweden. I flew only 48 wartime missions, but it was quite enough for me. We didn't dive bomb with the Blen, partly because we bombarded as squadrons. The plane was straightened out from a dive by pulling the stick normally, or actually it was sort of a steering wheel, not like that of a Junkers (Junkers Ju88A-4) that was already modern compared to the Blenheim. But I didn't miss flying Junkers the slightest, the Blen was so fine, the only thing that mattered to me was getting to fly. At the bombing of Lavansaari, the bad weather caused hell of a trouble. 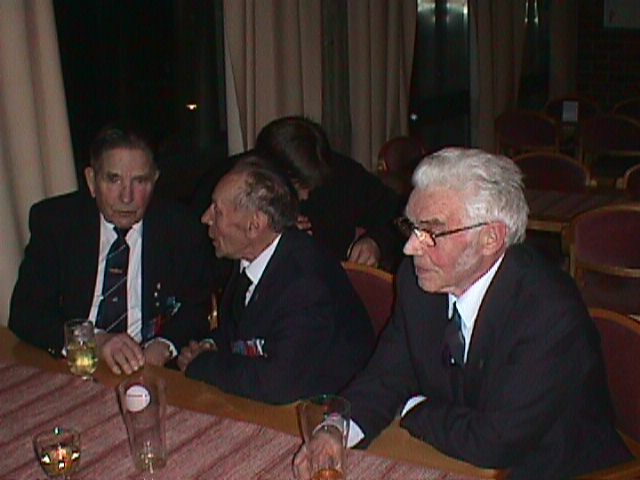 I had 270 flight hours when I came to the frontline squadron, some boys had earlier come there with only 100 hours. There was an order from the Air Warfare School to teach blind flying. I spend countless hours in the Linktrainer, a hooded simulator for flying triangle flights at Kauhava. That training was a lifesaver, it made no difference if I flew in clouds or clear skies. Although the Blen was sensitive about altitude. Enemy fighters never got to really try shooting me down, the incident at Äänislinna was the tightest spot. But I have damn sharp sight, if I may say so myself. Once over Lake Ladoga in '44, guess it was the landing at Tuulos, we were coming back with Aho (nowadays a professor) and Alalampakki, I saw two dots coming down and guessed they were fighters. Pentti Partanen was my navigator and Yrjö Pönttinen the gunner, they told me to calm down, we'd soon be home. But I kept ready, and suddenly Pönttinen calls out, fighters behind. I dove right away and circled a hill, and could only watch them take out Aho's and Alalampakki's planes. Navigator Rouhiainen bailed out of one, but he opened his chute too early and was caught in the rudder. The gunners had been killed first in their pass, only the pilots survived. I saw their chutes open among the trees, as it seemed when looking up from the valley, it was near Ilomantsi. So two fighters came but they didn't find my plane, and left after shooting down the two others. This incident is described in the article Kauko Aho - Blenheim Pilot In The Continuation War. My pilot course was a good one. I counted the kills that my coursemates got, those who were assigned to fighters, and if they were divided to the 28 of us who graduated, I also would have 1.5 kills. Eero Halonen, the eldest of us, received the Mannerheim Cross in a year. He shot down 16 IL's (Ilyushin IL-2 Sturmovik) in three weeks with the Me109, those were ground attack planes with rear guns. According to Eero, if you hit a certain spot over the engine, it'd surely come down. Another such spot was at the base of the wing. I guess you could shoot forward in a Dornier (Do 17Z), I didn't know them at all. From us, Pekka Kaisla was assigned to them. Dornier was slower and stiffer than the Blen. If the Blen had had proper weapons, it could have been used even as a fighter. But the pilot had only two rifle-caliber guns, and the gunner also one. (The Bristol Blenheims assembled in Finland had one 7.7mm machine gun in each wing, the English-made had only one in the left wing). Of the navigators I must say that if the pilot didn't know where they were, neither did the navigator. In our squadron, there were a couple of navigators who knew, but they had been already in the Winter War. But these new ones who came from the Reserve Officer School had received only brief training. In the aerial shooting exercises at Laajalahti, a Tuisku (VL Tuisku) pulled a target bag. Each who took part in the exercise had different coloured rounds, so after the exercise we could check who had hit. Five hits was a satisfactory score. There were always five of us who shot at the same bag. Once when the Tuisku landed to change new bag, I wondered why one pilot was always going first to check the bag. Then I saw that he had bullets of the same color he had used and added holes to the bag. We used old GT (Gloster Gauntlet II) and other planes in the exercises, they were quite nice to fly. They had been in service in the Winter War. 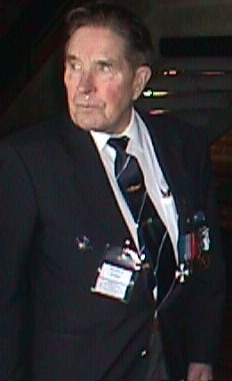 The old flight officer Otto Niemi was the teacher and oversaw the flights. He warned us not to close one eye when shooting but to keep both open. In the air-to-ground exercises we shot at damn big boards. One pilot from an officer course crashed into one and that was his last flight. The practise bombs used in dive bombing exercises had a 12.5 kg lead weight. We were supposed to get as many of the weights as we had used from the sandy beach after the exercises, but they were difficult to find. I did my best. Once when we were leaving to see the Finnish Championships, a coursemate asked me to lift his bag to the back of the truck. It was damned heavy to lift. I guessed there were bomb parts inside, and I saw some in his backpack too. A junk store in Helsinki paid 1200 mk of a pair, so I don't know what would have happened to him if someone had found out and reported him. We took our bombs usually to the Aunus Isthmus, I was over the Isthmus 30 times in summer '44, first at Kivennapa. And then we bombed ships at Wiborg Bay, invasion troops. The ships were moving, so I don't know if we scored one hit, guess it was only waste of munitions. We dropped our load at 500 meters there, but usually we bombed at 5,000 meters. The commander told us to just drop our load somewhere in the area, it was so full of Russian equipment that we'd always hit something. The Russians executed such an artillery barrage there that there hasn't been any before or since. And they shot in the air too, that's why we flew at 5,000 meters and so we didn't lose planes, were it day, twilight or night. Unlike the Flying Fortresses over Germany, they flew all day round and suffered terrible losses. This article is Copyright VLeLv Icebreakers / Virtuaalilentäjät r.y. 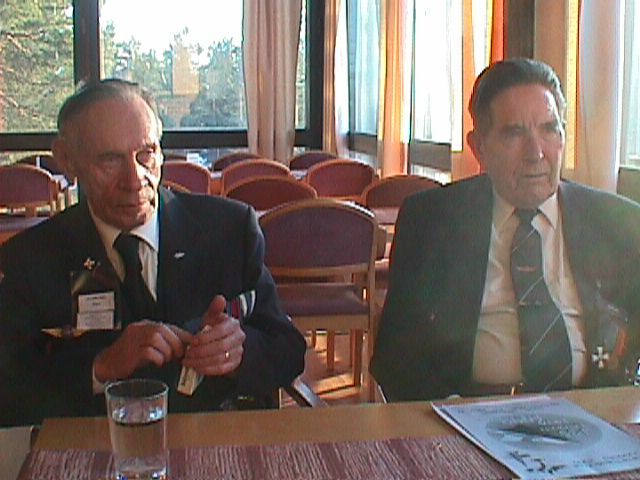 / Finnish Virtual Pilots Association 2001. Article is based on interview of Pentti Aro by Risto Korva in the annual meeting of the Lapland Air Command Guild, March 24th 2001 at Rovaniemi. The interview was transcribed by Jari "Elk" Halivuori. Photographs: Olli Korhonen and Risto Korva.